Few things can be more annoying, or inconvenient, than unauthorised parking. At Greyhound Racing, the issue was becoming extremely troublesome indeed. Staff and visitors were leaving their cars all over the place, and the knock-on effects were quite dramatic. Management and senior staff needed to be able to move around freely in order to do their jobs properly, and with other vehicles in the way, it was becoming more and more difficult for them to do so. The managers often had difficulty moving their vehicles out of the carpark to attend to their duties. Likewise, when returning, they would regularly find the path back to their parking space blocked. Finding vehicle owners took time (assuming the owners could be found) and put pressure on an already busy schedule. It seems like a minor thing, and in many ways perhaps it is. However, if you have ever found yourself in this situation, you will know how frustrating it really can be. The Solution to this problem was simple. After discussing the problem with Greyhound Racing, SHUG installed a removable bollard at the side of the property. 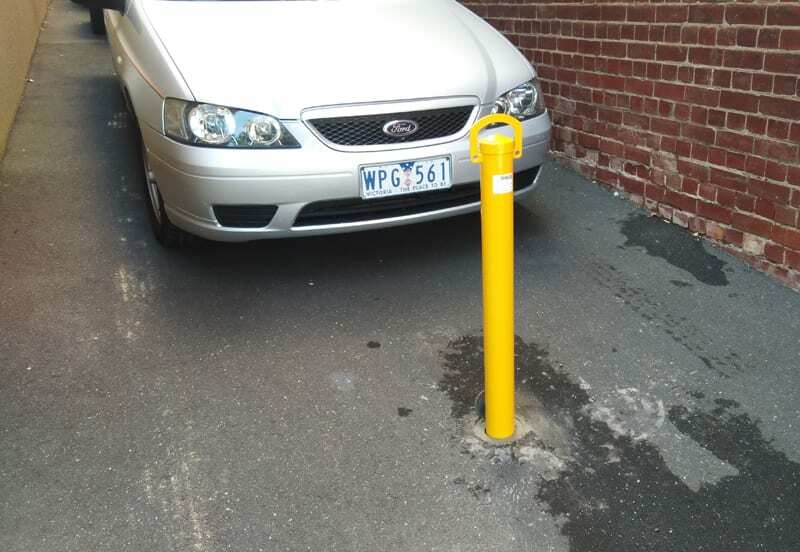 SHUG removable bollards lock into place to provide a strong, visible barrier against unauthorised vehicles, but when required, they can be unlocked and removed easily by key. The top lock is tamper-proof, and an additional padlock can be added at the bottom for extra security if required. Since installation of the bollard, the problem with unauthorised parking has completely disappeared. Now able to come and go freely from the premises, management can work more efficiently. Don’t suffer unnecessarily if you have a problem with unauthorised parking. Perhaps your parking space is often occupied, or even blocked by someone else’s vehicle? SHUG can help. Call us today for advice, and a no-obligation quote.